Roasted Brussels sprouts are already amazing, and they get kicked up a notch with avocado and pecans! For years I wasn't much of a brussels sprouts fan, and then I tried roasted brussels sprouts. Roasting them gave the brussels sprouts an amazing nutty flavor (and the fact that the recipe had balsamic vinegar, Parmesan, and pine nuts didn't hurt a bit.) Since then I've made two more variations of roasted brussels sprouts, both equally delicious, so I probably didn't really need this recipe on the blog. 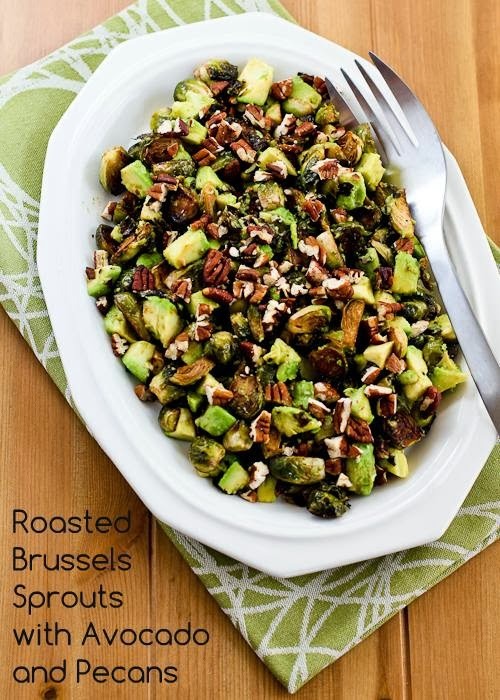 But when I spotted a recipe in Food and Wine for Roasted Brussels Sprouts with Avocados and Pecans, I couldn't get that flavor combination out of my mind.